Did a Southern belle once wear this pretty vintage dress? ..look at the size of those onions! ...and look at the oxalis planted in....a funnel!! 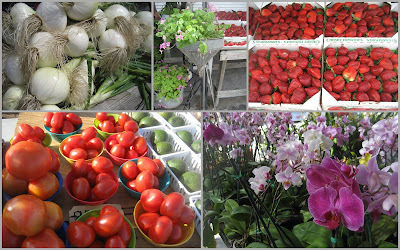 ...yummy tomatoes and strawberries and beautiful orchids! ...it was a bit frustrating to only be able to purchase what I could pack! ...and guess who I will be meeting? Yes! On Friday morning, I will be meeting our very own Zita of Mlle Magpie! We plan to share a cup of coffee and perhaps even a bit of antiquing! Oh i am so glad you are having a good time! And that you are filling your time! ENJOY!! The pictures are lovely! That dress is amazing! What a fun flea market- and such great purchases you made! I just loved the photo of the ice cream scoops- fun! Ooo to be at that flea market, how wonderful! Ohhhh I am for sure going to Websters now that I have seen your pictures. I NEED vintage garden stuff...hahaha. Glad you enjoyed FL.. The flea market looked fabulous. It is frustrating when you know you can only take home what fits in a suitcase. It still looks like you are taking home some fun finds. Wow that was some flea market. Sounds like you have had fun. I am having a Easter Candy Cup Giveaway. Stop on by for a chance to win! Oh heavens, I was at Webster Flea Market on Monday. I wonder if our paths crossed? I am cooking vegetables from the market for dinner. I live east on the coast and only go over with a group, a few times a year. Lovely photos!!! I'm in tampa and it has been quite chilly! Looks like you had a fabulous time. So many beautiful goodies, the dress is fab, all the mixed media beauties and then off to Montreal, does it get any better than this? Oh, man, I am envious, too! I love all of the beautiful stuff you have been seeing/doing/collecting, and now you get to do it in Canada as well!! Just wish I could go with you!!! :) Thanks for sharing your BEAUTIFUL photos!!!!!!!!!! Montreal, huh??? I am SOOOO jealous!!!! Take me along in your suitcase?? I like the oxalis in the funnel. Such neat things. Great pictures and now I am gonna look around your blog some more. What charming treasures. I particularly love the keys and the silver., and also the hat pins and lace that easily could have donned the lovely vintage dress. What a fun flea market. Glad you enjoyed your time in Florida. I am envious you are going to Montreal. I loved it when I visited the city. Fun Laura! Lots of goodies to find in Montreal too! Webster Flea Market has been around forever! I used to visit as a child with my parents. It's nice to see it is still going strong! What a fun place to visit. I'd hate to leave it all behind too. You did get some great treasures though. Enjoy your trip and visit North! You ARE lucky, Laura! Sounds like a great week and more fun to come in your next trip:) Love your purchases. Perhaps we should all pretend we have to pack what we buy, it might help keep the cost down, hehe. Have a safe journey home! Hugs from Georgia! Woowww my friend what lovely finds!!! I love those bottles!!!! I wish i was there with you................have a good time !!! Well, now you know what to do with your funnel !! Looks as if the Floridian flea markets are pretty good. I love the manatee in the bird bath ! I can't wait for the flea markets to start up in my neck of the woods! 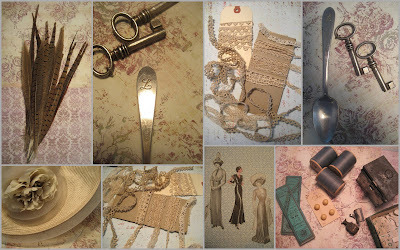 Fabulous photos of wonderful treasures. Thank you for sharing!! 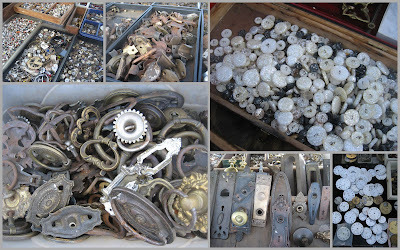 Laura..I am drooling over that collage of all those rusty and old pieces of 'junk'! I think I might have to hop on a plane to FL...lol....I am glad you found some goodies for yourself, LOVE the lace and everything else. It must have been very frustrating to have to limit yourself to small things. We will have to rent a u-haul and make a road trip one day!! OH what a fantastic fleamarket!! I love the reamers! And the buttons! It looks and sounds as though you had an awesome trip!! PS, that flea market looks heavenly! Hey lucky girl, you bought nice things. I love the hat pins holders and I wish I was there. Looks like you are having a great time. That is so nice, love your sweet finds. I wish I could have snapped a few of those lovely goodies, look at the silver, wow!!! Have a good time in Montreal, it is so beautiful there!!! Even without a big enough suitcase you still did well. I clicked on for a closer look and even the paper you set everything on was gorgeous. See I don't miss a thing! Waw lucky Laura! What exciting life you have! 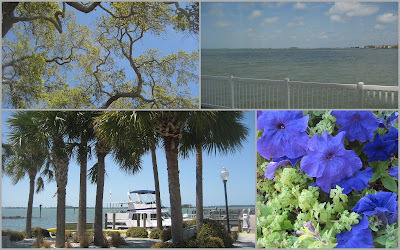 Fantastic photos from Florida and faboulous treasures you found!! Poor Rob...he missed you!!! He'll be much sweeter when you'll come back home!! !I'm looking forward you post from Canada! Enjoy! I love flea markets. This one looks fabulous. Happy travels! Ahhh.. Webster! I love that jaunt! Living in Tampa Bay, I should be ashamed I don't visit there more often. I keep telling hubby to take a Monday off and take me! LOL Those were some wonderful finds you pictured!!! That photo of the old bottles is gorgeous.